Arsenal (also known as Southern Fury) is a 2017 American thriller film directed by Steven C. Miller and written by Jason Mosberg. The film stars Nicolas Cage, John Cusack, Adrian Grenier, Johnathon Schaech, Christopher Coppola and Lydia Hull. The film was released on January 6, 2017, by Lionsgate Premiere. 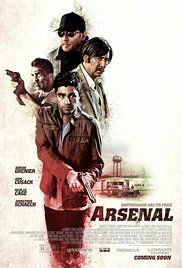 Arsenal received negative reviews from critics. On Rotten Tomatoes, the film has a rating of 4%, based on 28 reviews, with a rating of 3.1/10. On Metacritic, the film has a score of 25 out of 100, based on 10 critics, indicating "generally unfavorable reviews". Read more on Wikipedia.